Today we ate at a new restaurant, I believe this is the second restaurant, it has an older brother. I had the Street Ramen noodles and they were quite good. It came with an egg, a couple types of mushrooms, and sliced “luncheon meat”. That’s the friendly phrase for Spam. We also sampled the lamb kabobs and my husband ordered the wasabi tripe for an appetizer. I did try a bite and am proud to say that I did not gag or let it fall out of my mouth into a napkin, but I do not think I’ll be ordering that one for myself anytime soon. They also do a hot pot so we plan on returning to try that out, it looked yummy and like a lot of fun when we watched others eating it. 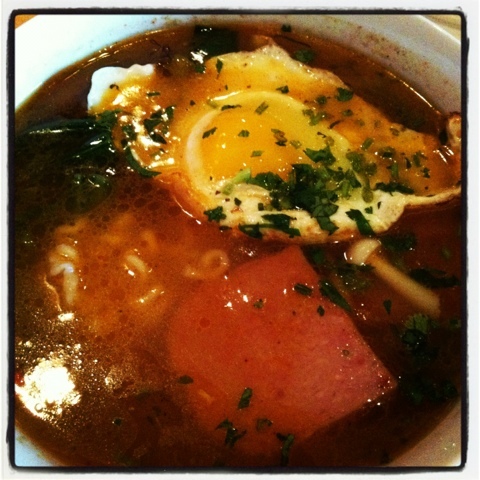 This entry was posted in Instagram, Project 366 and tagged Asian, Chen Z, Noodle, Ramen, soup, spam. Bookmark the permalink.